The Gandhi Foundation’s Annual Lecture and Peace Award were held this year in conjunction with The Honourable Society of the Inner Temple. 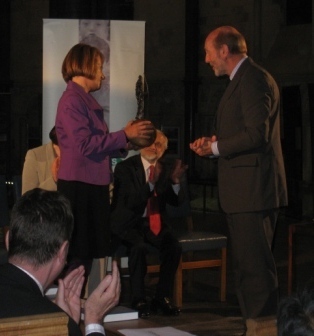 The venue was the historic Temple Church, a building originally founded by the Knights Templar and now used, not just as a place of worship, but also for promoting understanding between faiths and peaceful dialogue on a variety of issues. The Inner Temple had expressed their desire to have closer collaboration with The Gandhi Foundation as Mohandas Gandhi was admitted to the Inner Temple in 1888. The preparation for the 2009 joint Annual Lecture started over a cup of coffee at the Sub Treasurer’s, Mr Patrick Maddams, office in spring 2008. Later, when the Peace award was agreed to be given to The Children’s Legal Centre, it was decided to join the two events. The date of 14th October was chosen as the most suitable given that on 2nd October, Gandhi’s birth date, many other events would be taking place. Fasken Martineau, one of the world’s leading international business law and litigation firms with more than 650 lawyers with offices in Canada, the United Kingdom, France and South Africa agreed to sponsor the event. This enabled us to offer free tickets. Over 500 people from governmental bodies, legal firms, social services, academics and other organisations were contacted. Approximately 300 people came to the event – one of the largest numbers since Shabana Azmi received the award on behalf of Nivara Hakk in 2006. Lord Bhikhu Parekh, a Patron of The Gandhi Foundation, welcomed the guests and explained the reasons why The Gandhi Foundation had chosen to present the 2009 International Peace Award to The Children’s Legal Centre (CLC). The Peace Award was presented by Denis Halliday, a former recipient of the award himself, who had flown in from Ireland especially for the event. The Gandhi Foundation International Peace Award is a means to acknowledge works of individuals or organisations that have actively and consistently adhered to the guiding principles of nonviolence and importantly have had an impact on either the political, legal or social challenges of our times. The CLC certainly fit these criteria. One additional criteria, is that of an ‘un-sung hero’ i.e. people doing incredible work but not having been formally recognised. When they were originally nominated, The Gandhi Foundation did not know much about them, but after a few weeks of research we were truly amazed at the breadth and scope of their work. The work that the CLC are doing in representing young and vulnerable children, especially girls, and in helping to change the legal structures relating to children, is incredibly important. The outcomes affect not only the lives of these children but society at large and the future prosperity, not only in economic terms, of nations. The fact that the CLC’s work is especially focused in helping vulnerable girls from either social or legal abuse is, in our opinion, very important from a Gandhian prospective. Mahatma Gandhi greatly valued the social role of women and called them the architects of civilization. He deeply lamented their inferior treatment and marginalization and insisted that unless women were given full equality society had no hope. One of the defining features of any civilised society should be how it treats those that are marginalised, vulnerable and without representation. The CLC’s work certainly brings that representation, care and humanity. Following the presentation, The Rt Hon. 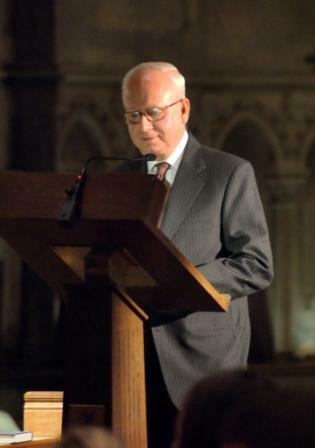 Lord Justice Laws, Lord Justice of Appeals, took the stage to introduce Justice Aftab Alam of the Supreme Court of India, who had kindly agreed to give The Gandhi Foundation 2009 Annual Lecture. His speech on The Role of the Indian Supreme Court in Upholding Secularism in India was very well received and the transcript is available by clicking on the link below. A DVD of the event will also be available shortly. The lecture will also be published by the Inner Temple. Following the lecture, a short Q&A session took place followed by a drinks reception, sponsored by Hardwick & Morris, Chartered Accountants. Wow! 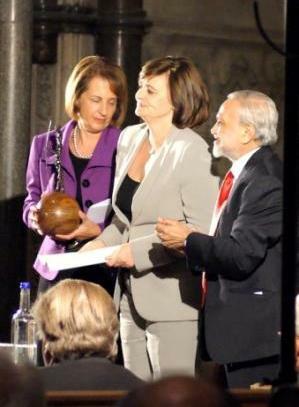 Cherie Blair attends a peace prize? Talk about irony. The wife of someone who has the blood of many thousands on his hands.